Let’s Hear It for the Saints! Hallelujah for our patron saints and for Churchly imagination! and benign St. Barbara who by lightning bolt, one day, became Patron of Fireworks. 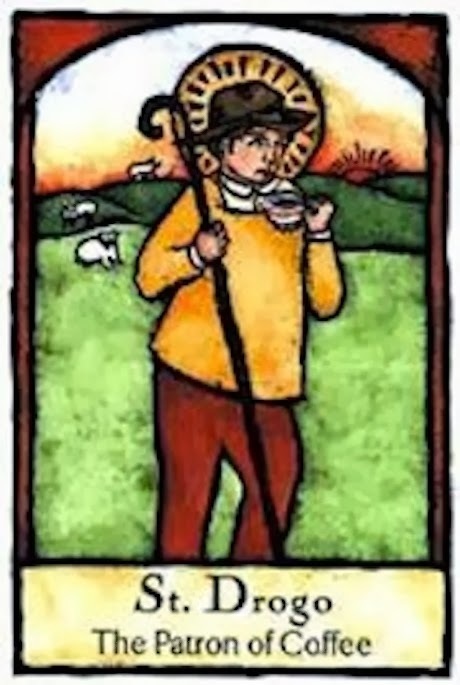 as Blessed Patron of Coffee we pray to him for perks. Patron Saint of Unattractive People, which seems a tad inane. on tourists down with dysentery, which makes him the most able. Let not one amoeba on Smyrna’s Holy Hands lurk! The prompt for Day 26 of NaPoWriMo is to write a curtal sonnet, which is shorter than the normal, fourteen line sonnet. Instead it has a first stanza of six lines, followed by a second stanza of four, and then closes with a half-line or tail. The form was invented in the 1800s by Gerard Manley Hopkins, who used it in his famous poem “Pied Beauty.” A curtal may also include this rhyme pattern: abcabc, dbcd, c, which I, not a fan of rhyme, found a bit of a torment! Oh, well, only 4 more poems to write and April will go out like…a rose.